Residents head to the polls Tuesday to cast their votes in the state primaries, deciding races that vary from uncompetitive to hotly contested. Here's a primer on the candidates — and where you can vote. Tuesday marks a turning point in the 2018 Massachusetts election cycle. Residents will head to the polls tomorrow starting around 7 a.m. to cast their votes in the state primaries and decide races that vary from non-competitive to hotly contested. Here are some of the candidates, as well as information about where you can vote. Cambridge residents will cast their votes Tuesday, Sept. 4 from 7 a.m. until 8 p.m. in one of 29 local polling places, including Quincy House, one of the 12 undergraduate Houses on Harvard’s campus. 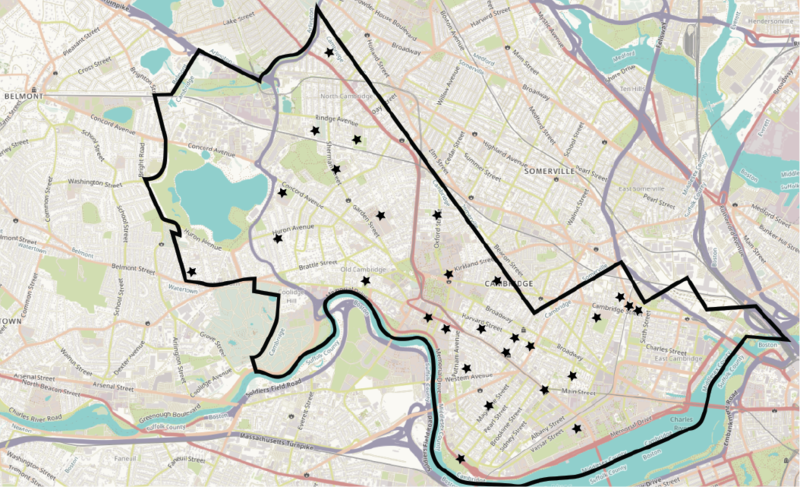 See the map below for some of the many nearby places to vote. Incumbent Elizabeth Warren is unopposed within the Democratic party in her bid for a second term as a U.S. senator. Several polls find Warren with a comfortable lead against her three Republican challengers — and with $31.5 million raised, she is the indisputable winner of the race for funding. From the Republican party, three candidates are vying for the chance to oppose Warren. Of the three, Geoff Diehl won the endorsement from the Massachusetts Republican Party. Diehl has made his name as a strong Trump supporter; in 2016, he was co-chair of the Mass. effort to elect Trump. His challengers are John Kingston III — who has rustled up $5.9 million, making him a more successful fundraiser than any other Republican candidate — and Beth Joyce Lindstrom, the first female executive director of the Massachusetts Republican Party. Dr. Shiva Ayyadurai, the self-proclaimed inventor of email, is running as an independent candidate. His campaign has proven controversial for his tactics against Warren, whom he calls a “fake Indian.” Polls suggest Ayyadurai is unlikely to win. “America’s most popular Governor” Charlie Baker ’79 is far and away the favorite to win re-election to the governorship. A moderate Republican, Baker has garnered a 74 percent approval rating in a traditionally blue state, the highest of any governor in the nation, according to polling done by WBUR radio station and a Massachusetts-based think tank. The poll found that Baker is more popular with Mass. women than Warren. On the Democratic side, Baker faces Jay M. Gonzalez — the former CEO of healthcare company CeltiCare — and Bob Massie, a longtime advocate for improved healthcare. Gonzalez, the former budget chief for former Mass. Governor Deval L. Patrick ’78, earned the endorsement of the Massachusetts Democratic Party at its summer convention. Incumbent Republican Karyn Polito was elected alongside Baker in 2014, and she has worked to tie herself to his governorship. She is unopposed within her own party, but will face two Democratic challengers in the Sept. 4 primary. Quentin Palfrey ’96, former senior advisor to President Barack Obama on jobs and the economy, is something approaching a native son of Harvard — he boasts degrees from the College and the Law School and is the child of Adams House Faculty Deans Sean and Judith Palfrey. He will face Jimmy Tingle, a comedian and the founder of the organization Humor for Humanity. Popular incumbent Democratic Attorney General Maura T. Healey ’92 runs unopposed as she seeks her party’s nomination for a second term in office. On the right, attorneys James R. McMahon III and Daniel L. Shores are vying for a chance to oppose Healey in November’s general election. William F. Galvin, Massachusetts’s eight term incumbent Secretary of State, is facing uncharacteristically steep competition from current Boston City Councilor and community activist Josh Zakim, who won the endorsement of the Massachusetts Democratic Party in a surprising upset at its July convention. The winner of Tuesday’s contest will face Anthony M. Amore, the lone Republican contender, in the general election. Amore is currently head of security and chief investigator at the Isabella Stewart Gardner museum. In addition to the closely watched races at the statewide level, incumbent Democratic representatives Katherine M. Clark and Michael E. Capuano, both of whom represent portions of Cambridge, are seeking their party’s nomination for their fourth and eleventh terms in the U.S. House, respectively. While Clark is running unopposed in Tuesday’s primary for the fifth district, Capuano faces strong competition for the seventh's Democratic ticket from Ayanna S. Pressley. Pressley, a current Boston City Councilor and the Council’s first woman of color, is relying on the momentum of her highly publicized opposition campaign to end Capuano’s 20 year tenure. The victor of this contest in the seventh district will go into the general election unopposed. In the fifth district’s November general, Clark will run against either self-proclaimed “working class candidate” John Hugo or dermatologist Louis Kuchnir from the Republican party. A previous version of this article incorrectly stated the time polls opened for the Massachusetts primary election. Polls opened at 7 a.m., not 9 a.m.